We've added a page which allows you to search the support forum for answers to your questions. It is located under the 'Contact' menu and is labeled 'Help & Support'. If you haven't signed up for the forum, this would be a great time to do so. Just click on the 'Feedback' tab on right edge of your browser window. There is a good chance that your question has already been asked by someone else. Second, a very big thank you to everyone who is helping out on the forum. It's great to see such quick responses and it has been a tremendous help. As we approach Christmas, Memverse has partnered with the Home of New Beginnings, a safe haven for the victims of human trafficking in Thailand. We are selling silver and gold pendants with all the profit going to support the work of the home. I would love it if you would consider supporting this ministry. We know the couple, Roy and Bonita Thompson, who started the home in Thailand and endorse what they are doing with great enthusiasm. My wife, Erin, has been working on this project since the beginning of this year and her friends who founded RedStart Design very kindly agreed to offer the pendants below cost, with all profits going to the Home of New Beginnings. The silk bags that the necklaces ship in are made by the girls who now live at the Home of New Beginnings. If you order in the next few days, we'll make sure that the pendants arrive in time for Christmas. More importantly, we'll make sure that the profits get to the Home of New Beginnings in time for their Christmas party where they invite girls to come and learn about the freedom we all have in Christ. 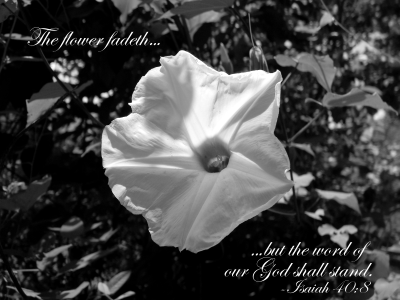 Some time ago, during one of my memorization sessions, I came to the realization that many of the verses I’d “memorized” weren’t sticking in my mind as well as I wanted them to. I would forget key words or phrases and, in some cases, even the entire verse. Since then, I’ve stopped adding quite so many verses per week and have instead focused on re-solidifying some of my past verses in memory. Over time I have noticed that I am now being able to recall most verses accurately and with little to no hesitation just like I had been able to before. Now I plan to pick up the pace and learn more verses per week than I’ve been recently, because I don’t feel like I’d be leaving behind previous verses in the process. You see, I say this because I believe it is important to not only memorize Scripture, but to memorize it well. Whether that means memorizing every “thee” and “thou” exactly as it appears in context, or scrutinizing whether you say “Jesus Christ” or “Christ Jesus”…well, those are all choices you’ll have to make yourself based on your purpose for memorizing and on how God leads you as an individual. But once you set your bar, don’t lower it! Don’t start compromising how well you memorize Scripture simply because you want to push your state to the top of the Leaderboard, but instead memorize in order to deepen your spiritual walk and – most importantly – bring glory to God. Thanks to Andy’s clever designing, memverse makes it easy for us to get a feel for how well we truly know our memory verses. Tools such as the Accuracy Test and Reference Recall both help tremendously. Even if you are somebody who doesn’t care too much about being able to cite the correct reference, Reference Recall is also very useful in giving you a variety of verses you might not otherwise see too often in your normal testing. So if you don’t utilize these tools often, let me encourage you to! They impart many more benefits than their name implies! First, sorry for the very abrupt site crash this afternoon. We released a new version today and things didn't go smoothly! There is now a new leaderboard (yes, I know, another one!) that tracks your referrals. You'll also notice that your referrals page now lists the people that were referred by people you referred. (I know, very complicated ... it's a pyramid scheme for a good cause!) Keep your eyes on this space because we'll shortly be announcing a competition on this front. It will be something along the lines of: whoever is on top of the referral leaderboard on Christmas day will get a $100 Amazon gift certificate. We've also made it easier to click through your verses when you're tagging them. No more waiting for your "My Verses" page to reload so you can tag the next verse. Yay! Finally, we're busy testing something that I've had in the back of my head for a long time now: the ability to upload sermons and attach them to verses. I know that many of the verses I've memorized were prompted by a great sermon on a bible passage. Unfortunately, in most cases, I've lost the sermon. I also think it will be cool to gradually build up a library of expository sermons on Memverse. I realize that there are tons of sermon libraries all over the web but I think we are gradually building up a community of people on Memverse who are exceedingly committed to understanding God's Word. My hope is that by focusing primarily on expository sermons (sermons that carefully and methodically explain a passage from the bible) we could create a unique library over time. If you have thoughts on this topic, please leave them in the comments below; I'd love to get your thoughts. Rest assured, we will definitely take great care to keep memorization as the primary focus of Memverse. Also, once you click through to a given verse, you'll notice a small [+] next to the tags that other users have used. To add one of those to your own list of tags, you can now just click on the [+] and it will be added to your tag list for that verse. We're working on cleaning up some of the tags that have typos and spelling mistakes but if you haven't checked out the tag cloud for a while, it has grown in leaps and bounds. The intended mission for this post is to create a place where everyone can encourage one another by sharing what large-(or small)-scale memorization projects they are currently working on. This post is obviously very small, so let's make up for it in comments!! As the photo above illustrates, even the most beautiful things in life will fade. Our life, as well as anything we might gain during it, is only a vapor. It appears for a while, and then vanishes away (James 4:14). Why then spend the few years we have on this earth seeking after things that won't last any longer than we do, when we could instead be laying up for ourselves treasure in heaven, "where no thief approacheth, neither moth corrupteth"? (Luke 12:33) The only thing on this earth that will last is the Word of the Lord. That is why it is so necessary to memorize it. We live a temporal life, surrounded by temporal things and temporal treasures; but through the Bible, God has made a way for us to have something eternal to carry with us along the way. I want to congratulate IBLP for joining the Church Leaderboard at an impressive 15th place, and then even more impressively jumping up to 8th place. I am curious. What does IBLP stand for? Actually, I am curious about more than IBLP. This is a blog for everyone to tell us a little about your group. Are you a local church? If so, how did Scripture memory get started in your church? Are others memorizing who are not on memverse? Are you a group of friends memorizing together in obedience to HEBREWS 10:24-25? Are you a rare Christian school that values Scripture memory? 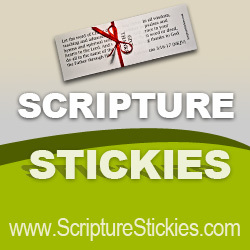 Are you a ministry or Scripture memory initiative others might want to join? Tell us about yourself. I love the global online aspect of memverse where I can be encouraged to see others memorizing the same verses I am and be inspired by individuals and groups all around the world. However, nothing beats the value of face to face Scripture memory encouragement offline. If you are not in a face to face Scripture memory group may I encourage you to pray about starting one in your church, school, college, work place, neighborhood, etc. May we continue to encourage and inspire each other and spread the word to others that all believers may be passionate about getting to know the true Biblical God through His Word. (on or off memverse) Speaking of congratulations, I would be amiss not to pass on heartfelt CONGRATULATIONS to the National Bible Bee for taking over top spot, and to Hyde Park Baptist Church for their steady rise to 5th place. A few weeks ago we went to the park with my family, and one of my cousins pointed this tree out to me. At the time I just thought it was a pretty cool tree, and so I took a few pictures of it. But a few nights later the Lord began to minister to me and show me the spiritual principles to be learned here. 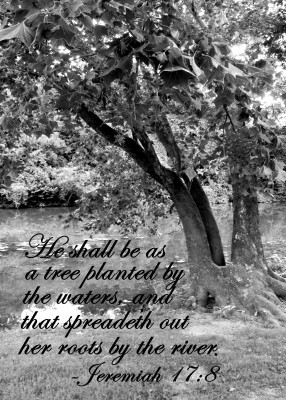 Just like this tree, "the man that trusteth in the LORD, and whose hope the LORD is" shall be as a tree "planted by the waters, and that spreadeth out her roots by the river, and shall not see when heat cometh, but her leaf shall be green; and shall not be careful in the year of drought, neither shall cease from yielding fruit." (Jeremiah 17:7, 8) Because Christians have a constant supply of spiritual nourishment, we should be able to bring forth fruit in our lives continually. When hardships fill our life, and at times when anybody else would throw in the towel, we can continue to press on. While everybody else is looking for the meaning of life in sinful things, we have found our own little oasis from which we may drink continually: God's Word. Whether we are in Sunday morning church service, or in the super market picking up a few groceries, we can receive what we need from God through the Word we have hidden in our heart. Just like this tree, those who have memorized the Scriptures can constantly be drawing strength and nourishment from it. While the world around us perishes with thirst, we can not only survive, but we can thrive! Today we introduced a first version of a new progression system on Memverse. It's intended to be a very complete Bible memorization program that will last a lifetime. At the moment, as evidenced by those of you who whizzed through the first six levels, it only lasts about a day! We can assure you that it will become more challenging. Our hope is that this will also help new users familiarize themselves with Memverse. It should also provide a sense of achievement for those who don't want to get too caught up in the leaderboards. You'll notice that we've also revamped the old 'reports' section under the 'Account' tab -- the one that you never visited :) Our hope is that the new Account Dashboard page will be increasingly useful in the future. It will encourage users to explore all aspects of Bible memorization and will require you to memorize longer passages and verses from all over the Bible. We've tried to not make it too restrictive but your feedback is welcome. We highly recommend completing at least the first ten levels as you'll get to explore all the major areas of the website. Many of the frequently asked questions will be answered in the reading in the first few levels. You will have to encourage friends of yours to join you in Memorizing the Bible. Those of you who have already reached level 6 will notice that you need to refer one person to Memverse. We'll soon add a page where people can designate you as the person who referred you. We also have plans for a fun new leaderboard where you'll get to add all the verses of the people you recruit and even the ones they recruit. See Ponzi for details. We will continually add levels to make sure that you never run out of things to do. It takes quite a while to add all the goals but we'll hopefully add a few new ones each week. Expect them to get quite a lot tougher as time goes by. We promise you that at some point in the future there will be games incorporating the verses you've memorized. If you have some great ideas, or would like to volunteer to write one, we'd be thrilled to hear from you. Remember that participation is optional. If you'd prefer to stick with your own memorization plan, you won't lose out at all.